When our first website, The Anxiety Network, went on-line in 1995, we were deluged with e-mails for information, help, support, and therapy. One of the largest sections of the Anxiety Network site was the "Social Anxiety" or "Social Phobia" section. Then, the phone calls, emails, and letters started arriving. They came in such a volume that we simply (and unfortunately) couldn't answer them all. I did try to answer all the e-mails that came to us, as there was a lack of appropriate information on the internet concerning social anxiety disorder (social phobia) at the time. Even at the beginning, though, when we were receiving only two dozen messages each day, people requested therapeutic help and were feeling desperate. They had found some information and hope in the Social Anxiety pages of The Anxiety Network, but they could not find psychologists or counselors in their geographical locations that knew what social anxiety was... or how to treat it effectively. This was quite a challenge, as I immensely disliked hearing how so many people were suffering (like I had) with this traumatic disorder. So, I shared this problem with the people who were in our local social anxiety behavioral groups. The main question was: "What is the best way to get across the cognitive therapy we do here at SAI to people who live around the world and cannot come to Phoenix for any of our groups?" We considered a book, a workbook, audio conferencing, telephone counseling, and what later became our international CCBT groups. And while the local and international social anxiety groups were full, we were simply not able to reach and help enough people, given the volume of requests from around the world. The incoming messages steadily moved up from a couple dozen a day to a hundred a day by 1998-99. Today, we receive many more than this. With no other licensed therapists to help me keep up with this deluge, maybe you can understand why I am sometimes overwhelmed. However, our big question at the time was, "What is the best way to help people overcome social anxiety who live in places where they cannot find adequate treatment?" This left us with just one answer: That was for me to record the exact same cognitive therapy that people who came to see me personally received. Recording the therapy was much preferable than just writing it down, because none of us had ever seen anyone recover from social anxiety by simply reading a book. There was no way to convey the meaning behind the cognitive therapy without people actually hearing it in my voice. Besides, this information needed to be therapy, not simply information. It needed to be "How do I...?" and "What do I do in this situation...?" material. It had to address practical situations that people with social anxiety faced every day. Thus, it had to be the same exact therapy we were using at SAI to help people gradually recover from social anxiety... and go on to live a life unrestricted by irrational anxieties. A page was added to The Anxiety Network in 1997-98 asking people if they were interested in a recorded therapy series for social anxiety. Over the course of the next two years, over 1000 people indicated an interest in an audio therapy series that would help them overcome social anxiety. The next barrier was me. I could not find the time between a full clinical practice (people with anxiety disorders), my weeknight and Saturday social anxiety groups, and the incoming four-week long CCBT groups to get the scripting done for the audio therapy series. The scripting started slowly in 1998, and some progress had been made by the beginning of the year 2000. However, by this time, I had to make more free time to get this mammoth project completed. There was no other choice but to take on no new clients and gradually say goodbye to my 1:1 psychological practice for people with anxiety disorders. The script for the series ran to over 1500 pages. This could have been two to three books. But reading a book and knowing about something is not therapy. It is not what people were asking for. Many good books about social anxiety already exist. People requested THERAPY, not information, from us. So recording each session, in progressive order, just the way an in-office appointment would happen was what was necessary. Before purchasing the therapy, people must agree to practice thirty minutes a day with the therapy itself, starting at home, and gradually working it out (gently) into real world situations. When I started recording the series we expected a sixteen hour-long program. Instead, we found that to include all the foundational therapy, the series was going to take 20 hours. Therefore, even though it was logistically more difficult to do, twenty hours of therapy was recorded, and a twenty audio therapy series was produced. 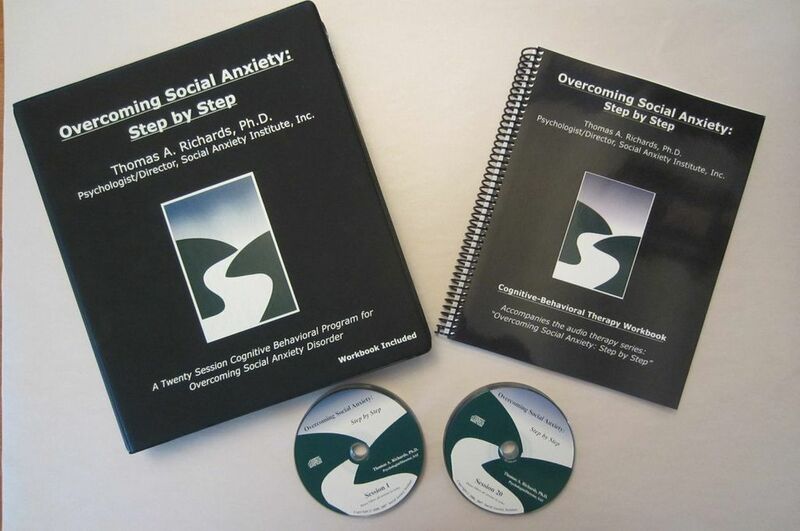 In addition to these twenty therapy sessions (cassettes or CDs), an accompanying workbook, also entitled "Overcoming Social Anxiety: Step by Step" was printed. Thanks to all of you who took part in making this decision, no matter where you live. And I am happy to tell you that, even though the first edition of the audio therapy series came out in October 2000, that it already has been sent near and far, from the United States to Europe to South Africa, Singapore, Australia, the Philippines, New Zealand, Norway, Mexico, Argentina, Italy, Pakistan, India, Egypt, and Turkey, among other locations. We are hoping that many thousands of lives will be changed through the use of the series and its cognitive therapy to help overcome social anxiety. What's Included in the Audio series "Overcoming Social Anxiety: Step by Step"